19 February 1982: At Renton Municipal Airport, Boeing test pilots John H. Armstrong and Samuel Lewis (“Lew”) Wallick, Jr., made the first flight of the prototype Model 757 airliner, FAA registration N757A, serial number 22212. A problem with the number 2 engine (mounted on the right wing) required an air restart during the flight. The prototype landed at Paine Field, Everett, Washington, after 2 hours, 31 minutes. Initially considered as an improved Boeing 727, the company determined that it was more economical to design an entirely new airplane. Along with the Model 767, which was developed concurrently, it was the first airliner produced with a “glass cockpit,” in which data is displayed on electronic screens rather than mechanical instruments. 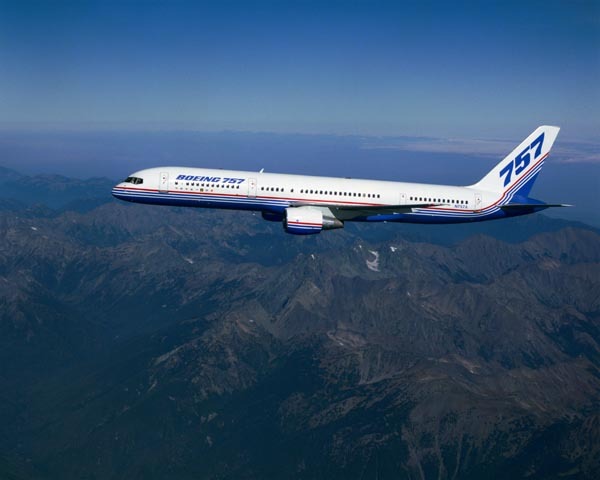 The Boeing 757-200 is a twin-engine, medium-sized airliner intended for short or medium length routes. It is operated by two pilots and can carry up to 239 passengers. 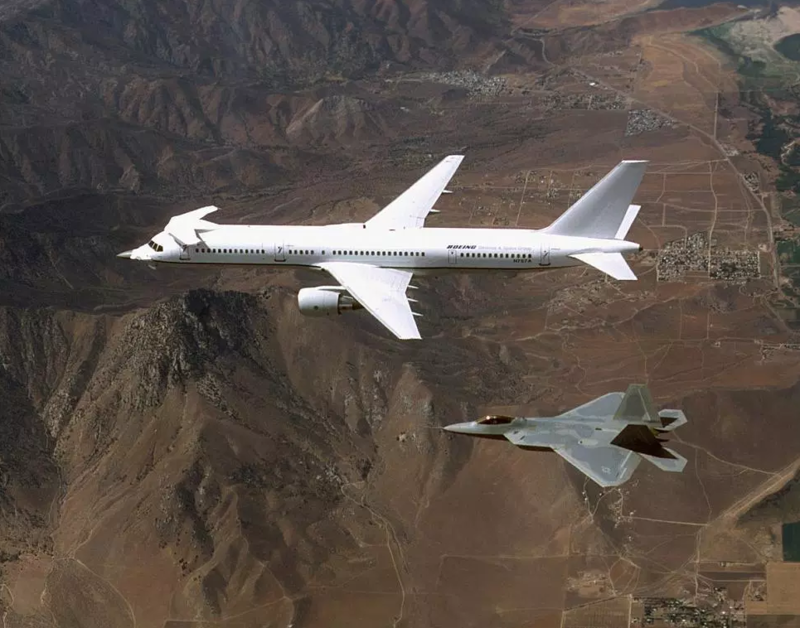 The 757-200 is 155 feet, 3 inches (47.320 meters) long, with a wingspan of 124 feet, 10 inches (38.049 meters) and overall height of 44 feet, 6 inches (13.564 meters). The airliner has an empty weight of 127,520 pounds (57,842 kilograms) and a maximum takeoff weight of 255,000 pounds (115,666 kilograms). The prototype was powered by two Rolls-Royce RB.211-535C turbofan engines. This is a three-spool engine using a single-stage fan, 12-stage compressor (6 intermediate- and 6 high-pressure stages), an annular combustor section, and a 5-stage turbine (1 high-, 1 intermediate- and 3 low-pressure stages). The RB.211-535C is rated at 37,400 pounds of thrust (166.36 kilonewtons). It is 9 feet, 10.5 inches (3.010 meters) long with a maximum diameter of 6 feet, 1.2 inches (1.859 meters) and weighs 7,294 pounds (3,594 kilograms). Production aircraft were available with either Rolls-Royce RB.211-535E or Pratt & Whitney PW2037 engines, with thrust as high as 43,734 pounds (194.54 kilonewtons) per engine. The Boeing 757 has a cruise speed of 0.8 Mach (530 miles per hour, or 853 kilometers per hour) at 35,000 feet (10,668 meters). The service ceiling is 42,000 feet (12,802 meters). Its maximum range is 4,718 nautical miles (7,593 kilometers). The Model 757 was produced from 1981 to 2004 in both passenger and freighter variants, or a combination. 1,050 Boeing 757s were built. The first 757, N757A, remains in service with Boeing. The airplane has been radically modified as an electronics test bed. 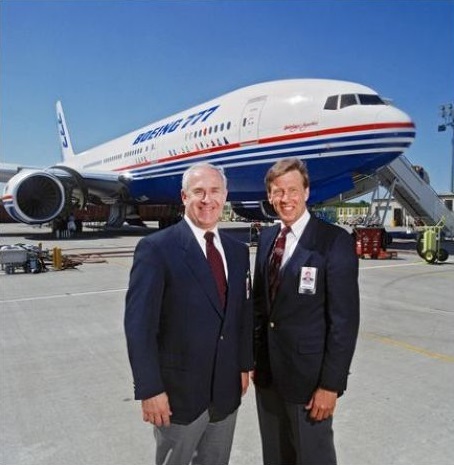 12 June 1994: At 11:45 a.m., Boeing test pilots John E. Cashman and Kenny Higgins took the first Boeing 777-200 airliner, line number WA001, FAA registration N7771, on its first flight. Before taking off from Paine Field, Boeing’s president, Phil Condit, told Cashman, “Good luck, John. And no rolls!”, referring to the famous incident when Alvin M. “Tex” Johnston rolled the Model 367–80 prototype of the 707 airliner over Lake Washington, 6 August 1955. 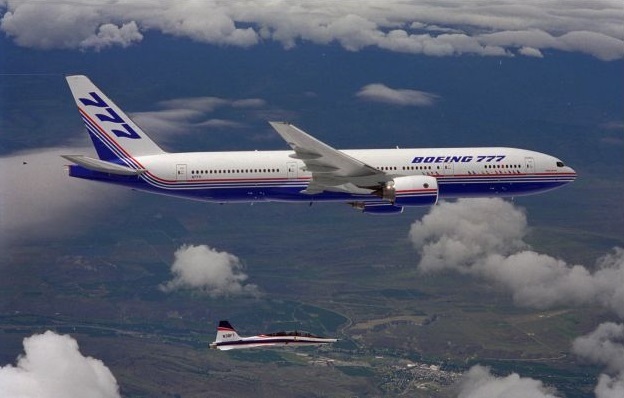 The 777’s first test flight lasted 3 hours, 48 minutes. 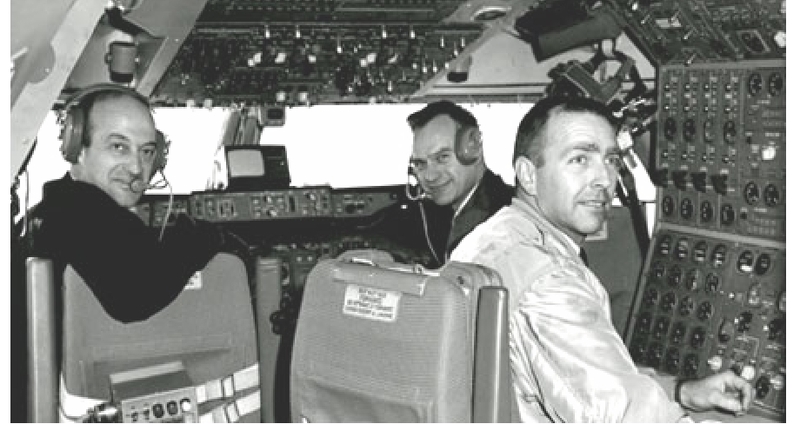 This was the longest first flight of any of Boeing’s airliners. It reached a maximum altitude of 19,000 feet (5,791 meters) and accomplished all tests on the flight plan, including shutting down and restarting an engine in flight. The Boeing 777-200 is operated by two pilots and, depending on its configuration can carry 314 to 440 passengers. It is 209 feet, 1 inch (63.729 meters) long with a wingspan of 199 feet, 11 inches (60.935 meters) and overall height of 60 feet, 9 inches (18.517 meters). The fuselage has a diameter of 20 feet, 4 inches (6.198 meters). The airliner has an empty weight of 297,300 pounds (134,853 kilograms) and maximum takeoff weight of 545,000 pounds (247,208 kilograms). WA001 was originally powered by two Pratt & Whitney PW4074 two-spool high-bypass-ratio turbofan engines which produce 77,000 pounds of thrust, each. Production airliners were equipped with PW4077 engines with the same thrust. General Electric and Rolls-Royce turbofans could also be ordered. Boeing 777s have a cruise speed of 0.84 Mach (560 miles per hour, 901 kilometers per hour) and maximum speed of 0.89 Mach (590 miles per hour, 950 kilometers per hour). The service ceiling is 43,100 feet (13,137 meters). The 777-200 has a maximum range of 6,027 miles (9,700 kilometers) with maximum payload aboard. 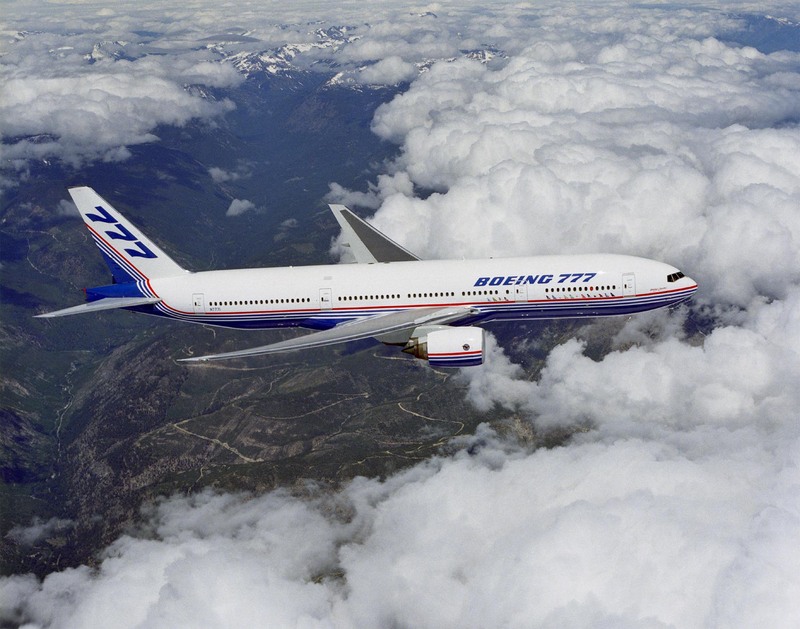 The 777 series was the most comprehensively tested airplane in history. Nine aircraft were used in the test program. WA001 was in testing until April 1997, by which time it had accumulated 1,729 flight hours and another 1,033 hours of ground testing. Purchased by Cathay Pacific, the first “Triple Seven” was completely refurbished and equipped for passenger service, configured as a 777-267. The engines were replaced by two Rolls-Royce RB211 Trent 884B-17 high-bypass turbofan engines. These engines are rated at 85,430 pounds of thrust for takeoff (5 minutes limit). Because of their lighter weight, the empty weight of the airliner was reduced approximately 7,500 pounds (3,400 kilograms). 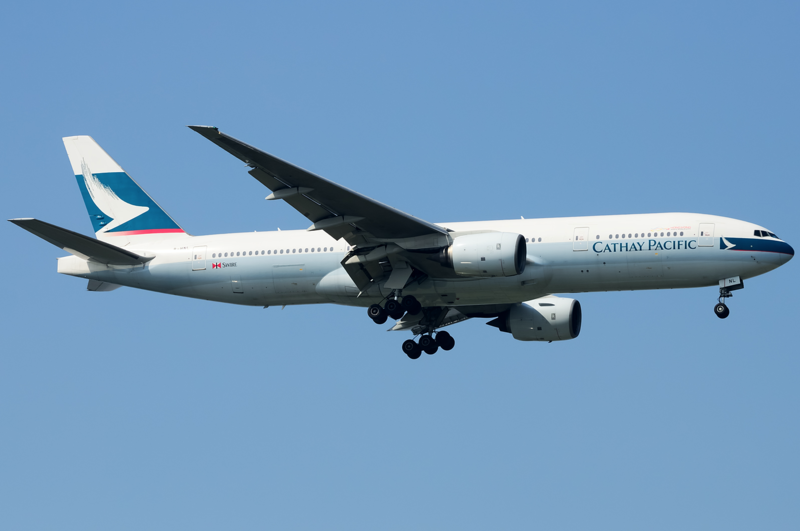 The airliner was rolled out of the factory for the second time 31 October 2000, and was delivered to the Cathay Pacific on 6 December, registered B-HNL. WA001 was retired 1 June 2018 and placed in storage at Xiamen Gaoqi International Airport (XMN), Xiamen, Fujian Province, People’s Republic of China. Reportedly, the first Triple-Seven will become part of the collection of the Museum of Flight at Boeing Field, Seattle, Washington. The 777 was produced in the 777-200 configuration, followed the 777-200ER (“extended range”) and 777-200LR (“longer range”) variants, a longer 777-300ER and a 777F freighter. A tanker version has been proposed. Eighty-eight 777-200 airliners were built before production halted in favor of the -200ER and -200LR models. 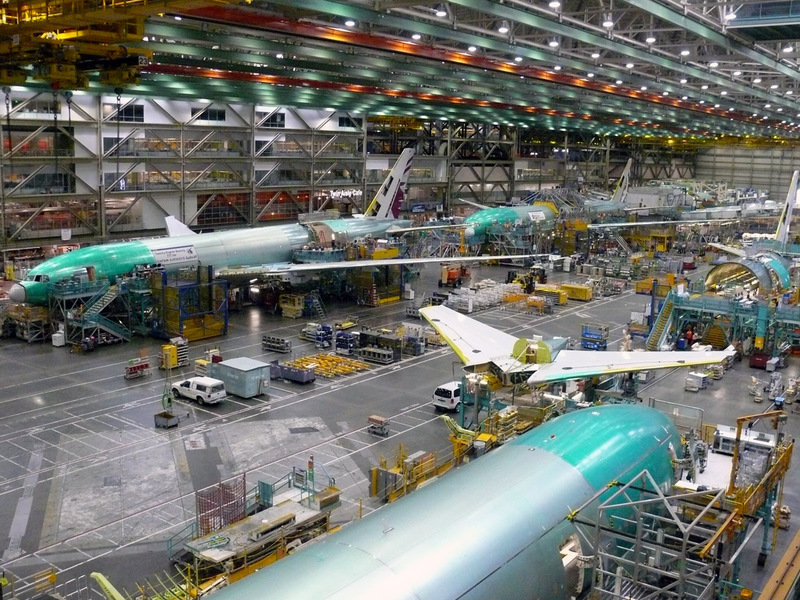 As of April 2018, 1,547 Boeing 777s of all models have been delivered. At that time, there were 60 777-300ER, 42 777F freighters, and 326 777Xs on order. 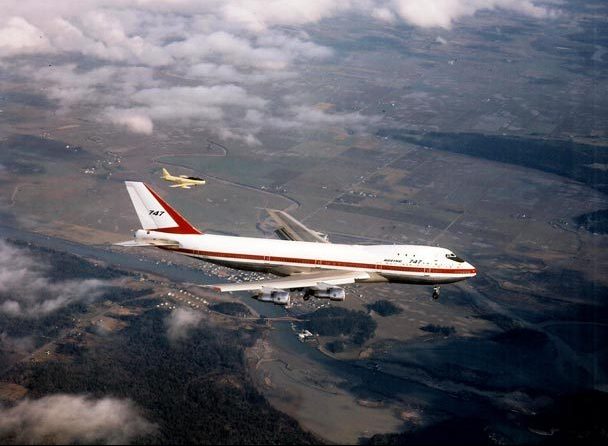 29 April 1988: Boeing test pilots James C. Loesch and Kenneth Higgins take the new Boeing 747-400, serial number 23719, registration N401PW, for its first flight from Paine Field, landing at Boeing Field 2 hours 29 minutes later. The 747-400 was a major development of the 747 series. 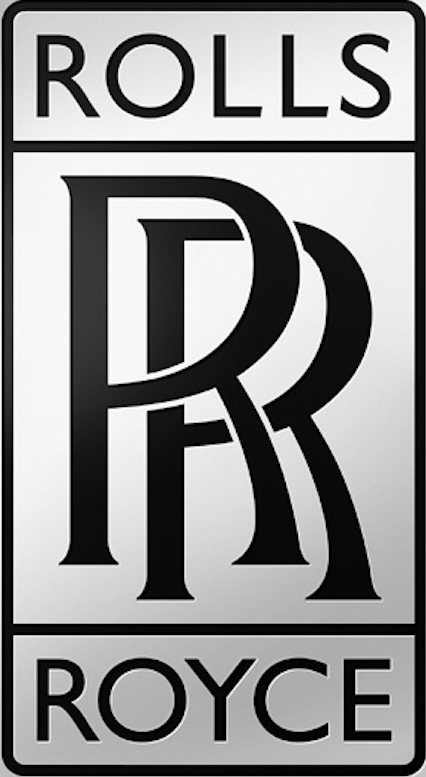 It had many structural and electronics improvements over the earlier models, which had debuted 18 years earlier. 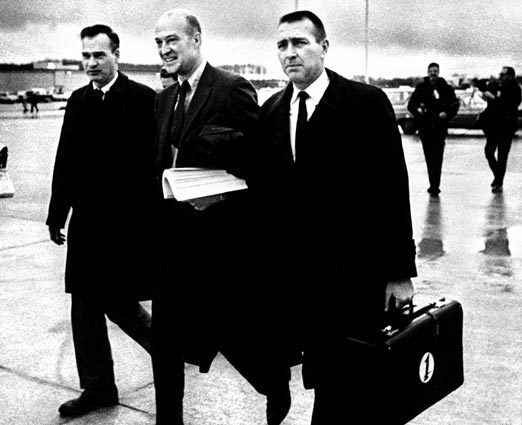 New systems, such as a “glass cockpit”, flight management computers, and new engines allowed it to be flown with a crew of just two pilots, and the position of Flight Engineer became unnecessary. The most visible features of the –400 are its longer upper deck and the six-foot tall “winglets” at the end of each wing, which improve aerodynamic efficiency be limiting the formation of wing-tip vortices. 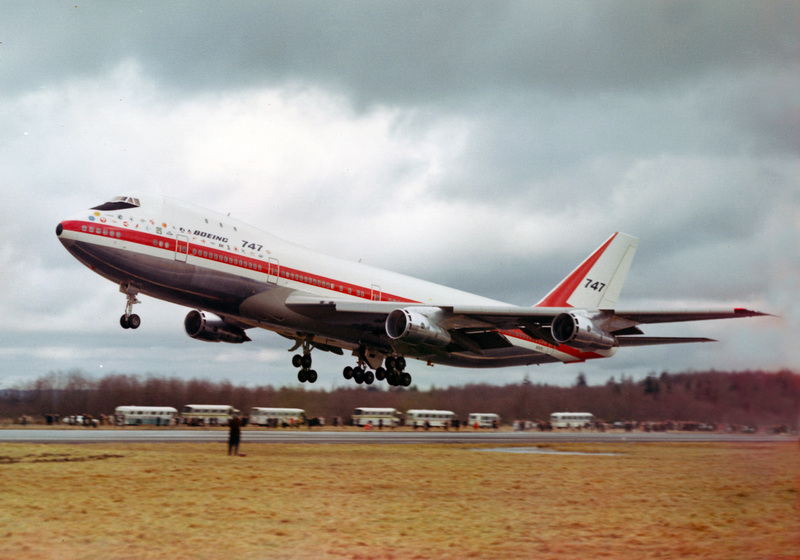 On 27 June 1988, this 747-400 set a Maximum Takeoff Weight record for airliners by lifting off at Moses Lake, Washington at 892,450 pounds (405,659 kilograms). 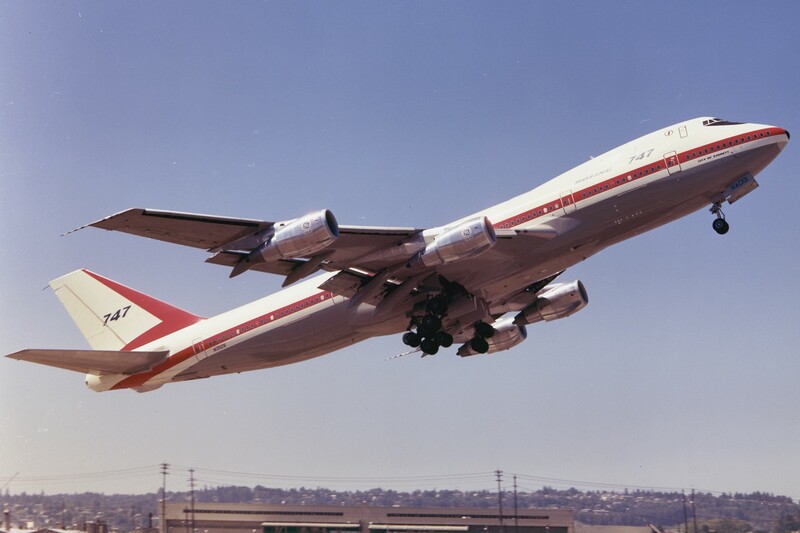 (FAI Record File Number 2203) At the time of its first flight, Boeing had already received orders for 100 747-400s. It would become the most popular version, with 694 aircraft built by the time production came to an end 15 March 2007. 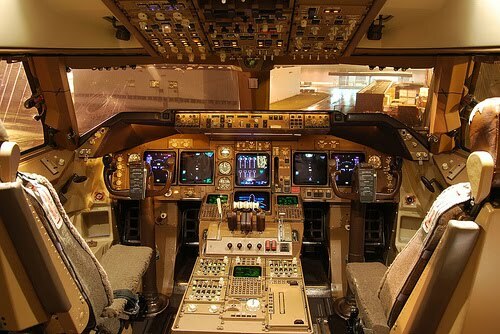 Cockpit of a Boeing 747-400 airliner. 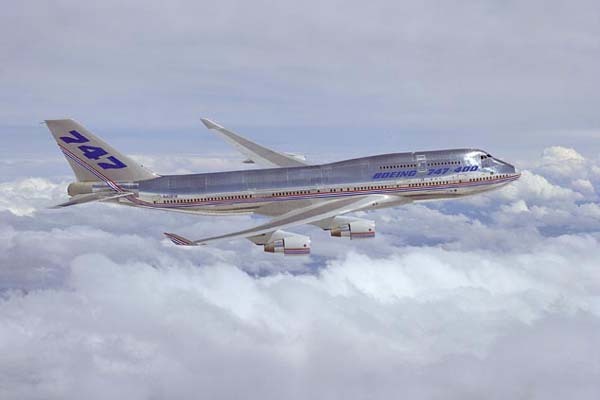 The Boeing 747-400 airliner can carry between 416 and 660 passengers, depending on configuration. It is 231 feet, 10 inches (70.6 meters) long with a wingspan of 211 feet, 5 inches (64.4 meters) and overall height of 63 feet, 8 inches (19.4 meters). Empty weight is 394,100 pounds (178,800 kilograms). Maximum takeoff weight (MTOW) is 875,000 pounds (396,890 kilograms). 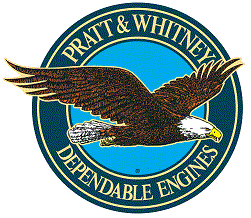 While the prototype was powered by four Pratt & Whitney PW4056 turbofan engines, production airplanes could be ordered with PW4062, General Electric CF6 or Rolls-Royce RB211 engines, providing thrust ranging from 59,500 to 63,300 pounds. The –400 has a cruise speed of 0.85 Mach (567 miles per hour, 912 kilometers per hour) and maximum speed of 0.92 Mach (614 miles per hour, 988 kilometers hour). Maximum range at maximum payload weight is 7,260 nautical miles (13,450 kilometers). 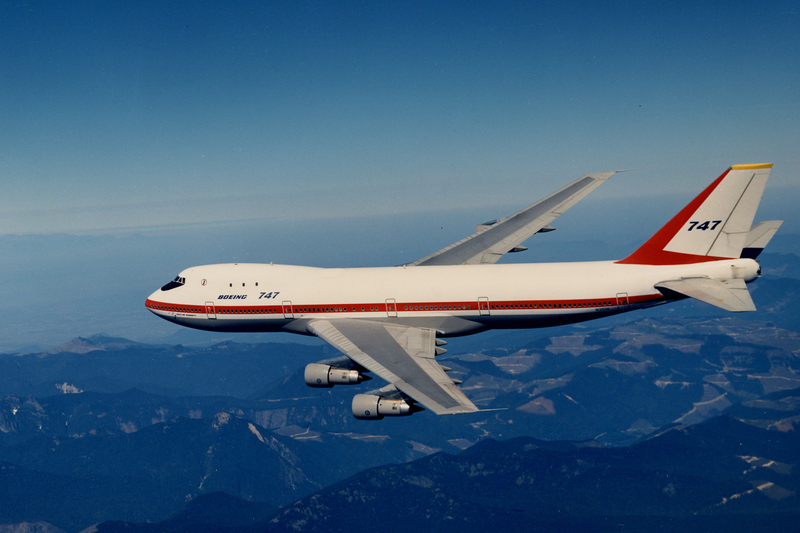 After the test program was completed, the prototype 747-400 was outfitted for airline service. 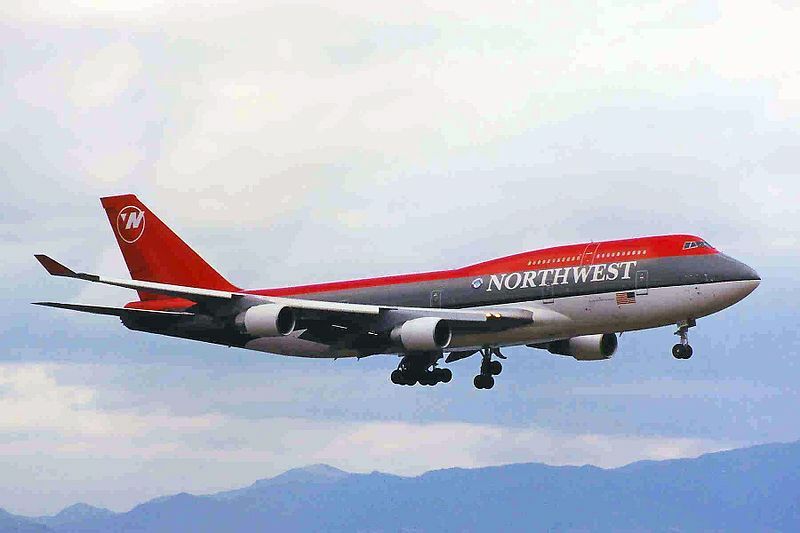 It was operated by Northwestern Airlines and is currently in service with Delta Air Lines. 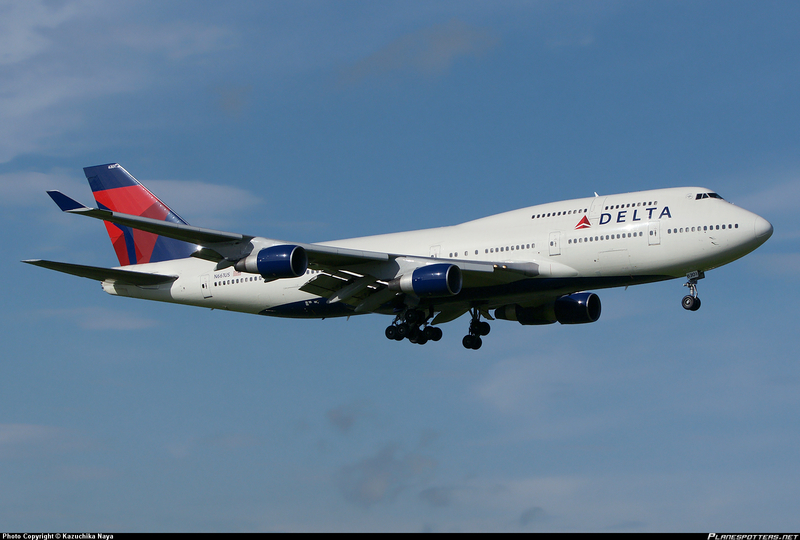 It has been re-registered as N661US, and carries the Delta fleet number 6301. 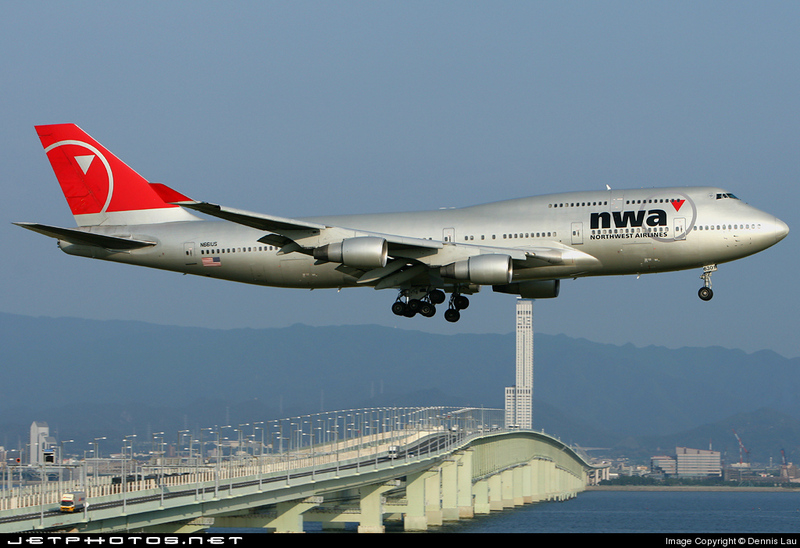 N661US was the aircraft operated as Northwest Airlines Flight 85 on 9 October 2002 when it suffered a rudder hardover while over the North Pacific Ocean. The aircraft went into a sudden 40° left bank when a hydraulic power unit for the lower rudder failed due to a fatigue fracture. This incident is considered to be an excellent example of Cockpit Resource Management (CRM) as the flight crew successfully landed the airplane at Anchorage, Alaska. After flying its final revenue flight, 9 September 2015, as Flight 836, Honolulu to Atlanta, N661US was stored at Delta Technical Operations and will eventually be displayed at the Delta Flight Museum, Hartsfield Jackson International Airport.